At Vancouver Community, our focus is on creating knowledge and applying it to client care. We provide services to thousands of clients through the full life span from pregnancy, children and youth, adults and elders. We also provide services to physically and mentally disabled individuals. There are hundreds of multidisciplinary health professionals working to ensure the best outcomes for our populations. We want to help you develop your research or evaluation idea into a project and to further support you through the process. Health research evidence does not automatically translate into policy and action. Studies have shown only 14 per cent of health research findings enter day-to-day practice, with a gap of 17 to 20 years separating discovery and implementation. The consequences include sub-optimal or unnecessary care, overuse or premature adoption of certain treatments, and new research that may not address priorities. The Vancouver Community Research & Evaluation Advisory Committee is comprised of researchers, program directors and managers who work in community health. It was established in 2014 to develop a multi-disciplinary research, evaluation, and innovation culture and environment within VCH Community. 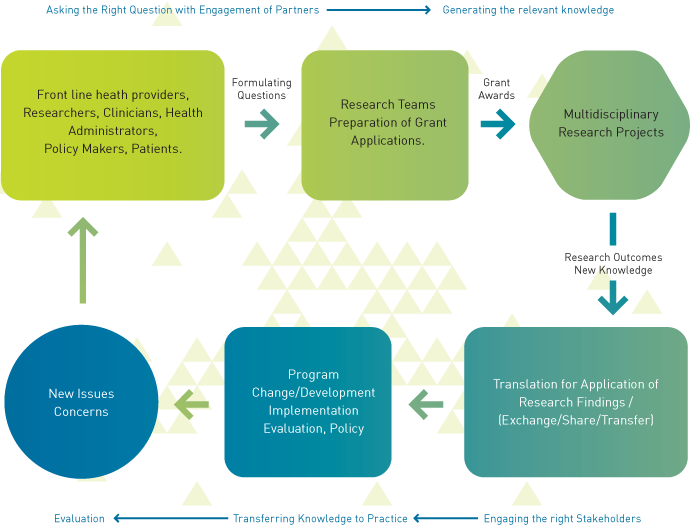 Our goal is to increase knowledge generation and translation by creating partnerships with researchers, directors, managers, frontline staff and clients. We expect that through effective partnerships, research and evaluation questions will be developed and projects undertaken, with the results used to benefit our clients. By working together in the early days of research and project investigation, we hope to do away with the difficulties experienced in the past, make the overall experience more positive, get more people involved and improve the lives of our clients.